Posted on February 8, 2019 at 2:56 pm. Jamestown Elementary School crossing guard Kathy Patterson has been recognized by the Virginia Department of Transportation’s Safe Routes to School (VA SRTS) program as one of Virginia’s Most Outstanding Crossing Guards for 2018-19. 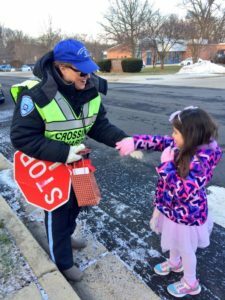 The recognition is part of Crossing Guard Appreciation Week, an annual Safe Routes to School celebration recognizing Crossing Guards for the critical role they play in the safe routes to school network. Nominated by multiple Jamestown families, Patterson is one of six Crossing Guards state-wide to receive the honor for 2018-19. VA SRTS received nearly 200 nominations for 72 different crossing guards throughout the Commonwealth this year. A Jamestown family whose home provides “full vantage to see the daily safety violations, close calls, and less than friendly attitudes from some drivers” had this to say: “Luckily, we also see everyday, twice a day, our champion, Kathy Patterson, the crossing guard who is ready and willing to take on these challenges to keep our children safe. Kathy not only fulfills the job of allowing our children to cross the street in the cross walk safely, but she does so much more. She arrives early to her post every day, places safety cones in locations to assist drivers in knowing where they cannot park and where they cannot stop. She uses her whistle for all good purposes – preventing delivery drivers from blocking the bus paths, drivers from blocking driveways of residences, drivers who attempt to make U-turns in the middle of the street… and so on!